Physics based simulations of cloth and liquid become one of the most important topics in computer graphics in accordance with the recent dramatic advances of fabrication technology. Especially, a calculation cost reduction in cloth simulation along with a garment transfer with keeping an original design and style are composing the hottest topic in this research area. Also a photorealistic facial animation along with facial soft tissue and expression muscle simulation has been a challenging topic for a long time without an epoch making solution. 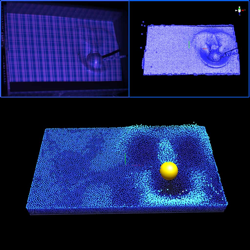 Shunsuke Saito, Nobuyuki Umetani, Shigeo Morishima, “Macroscopicand Microscopic Deformation Coupling in Up-sampled Cloth Simulation,” Computer Animation and Virtual Worlds Journal, CASA 2014 Special Issue, 25(3-4),pp.437–446. doi: 10.1002/cav.1589. May-August 2014.